When you walk through the woods near your home, you’re exploring. It’s fun, interesting, and exciting. While doing such things I have come across snakes (the Eastern Hognose variety), raccoons, unknown dogs (one who attacked my dog and me) and occasionally people I don’t know. Doing that exposes me to more variety and slightly elevates my danger from that of staying at home. It’s a good, wholesome, fun, enjoyable, and completely normal thing to do. That’s what having a typical child has been like for me. When I visited Arizona I went for a run on a public property near the home of my in laws. There were cacti all over the place, and I made mental notes that snakes that I might encounter would be of a venomous type, and that even such things as ants, which in Michigan are fairly benign, could cause me real grief. It was a bit more nerve wracking, a bit more exciting, and overall a great experience. I recognized that I was outside of my comfort zone, but it was within a reasonable proximity of normal, and it was more of a mindset change than anything else. That has been my experience parenting a child with Down syndrome. We took normal and kicked it up a notch. The territory we unknowingly entered with Ben is more akin to an equatorial jungle. The vegetation is so dense that making headway is arduous, slow, daunting and barely manageable. The variety of the flora and fauna is stunning. And terrifying. It’s crucial to remain focused and attentive every second, even sleep is a luxury during which a certain vigilance must be maintained. Specialized equipment is necessary to survive. Dangers lurk on every branch, flying, crawling, swimming. A brief break from watchfulness could land you in a life or death situation. It’s incredible it’s not for the faint of heart; only small populations live there, and tourists are few and far between. This is life parenting a child with complex medical, developmental and mental health needs. It’s life on the edge. We’re a highly specialized bunch, it’s adapt or die here, and adapt we do. We develop skills and equipment to manage our extreme environment, always looking for the next breakthrough. We’re capable and savvy, though a bit more fierce than most civilized populations. In the welcome to Holland poem, the comparison is Italy to Holland, but if you were planning a trip to Italy, imagine how woefully unprepared you would be in the jungle. Even for us, planning another trip to Arizona, would be completely lacking in equipment and skills for the actual journey we’re on. That’s where this analogy differs from the Holland analogy. This isn’t a trip that we’re fairly well prepared for, this is being dropped into a place where we don’t have the knowledge, skillset or equipment to survive, we have to ad lib the whole thing; our only skillset is improvisation and the will to survive. The most implausible part of it all is that we actually succeed at it; by sheer determination, fueled by passion and love. You know time crawls on when you’re waiting for your song to start so dance alone to the beat of your heart. Autism spectrum disorders are known to occur in individuals with Down, and statistics show that ASD is more common in Down syndrome than the general population. It’s hard to nail down, but a reasonable estimate, per the NDSS, of the incidence is 5-7% of the Down syndrome population having co-occurring ASD. I would estimate that number to be on the low side. Of those people with co-occurring disorders there’s a pretty clear description of the common presentation, which includes, but isn’t limited to; frequent stimming, little interest in social interaction, and often the individual is nonverbal. Suffice it to say, after reading about Down syndrome and ASD, I didn’t have any indication that Ben had autism in addition to Down syndrome. In fact, you could have knocked me out with a feather when we got his diagnosis. I got the book, “When Down Syndrome and Autism Intersect“, which further confused the matter by describing the standard presentation of DS/ASD, which was nothing like Ben. It took me quite awhile to wrap my mind around the ASD diagnosis. In fact, it was at last year’s local Down Syndrome Association picnic that the reality hit home like a sledge hammer. Ben was disregulated and riding the meltdown train the whole time, and the difference between him and the rest of the people with Down syndrome at the gathering could not have been more obvious. Ben is very social, in fact excessively so. What he lacks is reciprocity. He’s far more characteristic of what used to be considered a PDD-NOS diagnosis. Alas, Ben is an island. 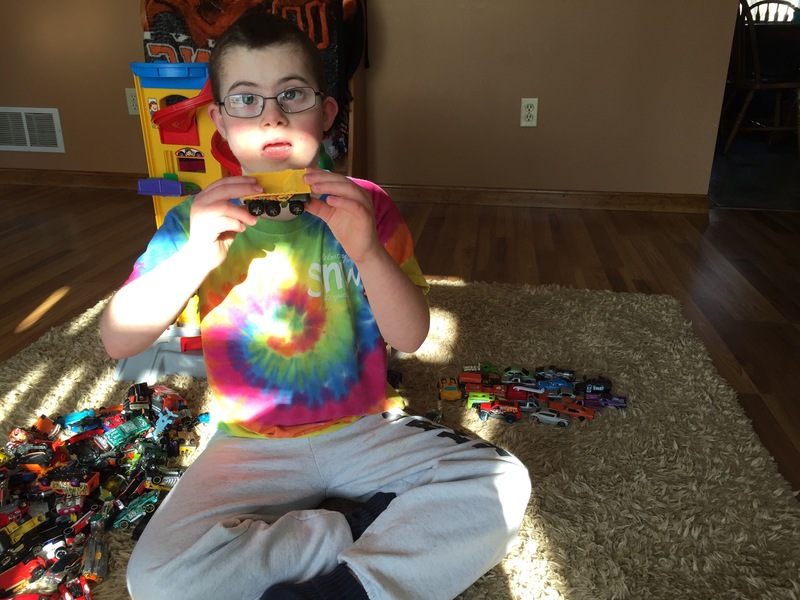 He doesn’t fit in the general Down syndrome community, nor does he fit in the DS/ASD community. I certainly don’t know what it’s like parenting other children with co-occurring Down syndrome and ASD, but I do know that it’s awfully lonely parenting our little man. The resources are not designed for us, they don’t address our challenges. Ben is who he is, and I love him in all of his quirky individuality, but man would I love to find a kiddo with a similar presentation. I could just imagine sitting down to coffee with his or her parents and comparing stories, watching their eyes light up as we all realize what we have in common. We bypass the standard Down syndrome, ASD, and DS-ASD resources, because none of them address our situation. For now we do alright on our own. Ben has his own drummer, and he sure is cute marching to the beat on his own.